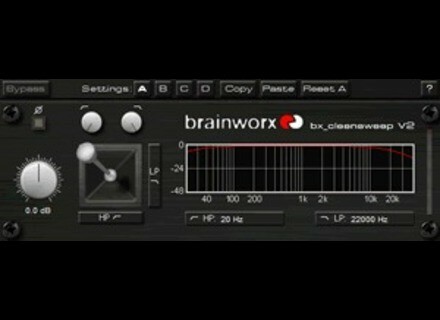 Brainworx has released version 2.0 of its freebie bx_cleansweep Hi-Pass filter and Lo-Pass filter plug-in featuring "Anti Crush Technology". It's now available for Windows and Mac OS X in VST, VST3, AU and RTAS plug-in formats. bx_cleansweep is designed to offer analog-style filter curves, without the typical Nyquist problems, in a filter design taken from Brainworx's pro mastering EQ bx_digital V2. First order filters (6 dB) are designed to guarantee a musically sounding filter set and joystick control (taken from bx_hybrid) is designed to give you fast and intuitive control. Shortcuts (Alt/Shift/Ctrl) allow for control over the X-axis and Y-axis of the joystick, and the EQ knobs can be set to precision mode by shift-click as well. MOTU Releases Ethno Instrument 2 MOTU has announced the release of version 2.0 of Ethno Instrument, an upgrade designed to double the size of the included sound library of instruments, loops and phrases. NUSofting Ethnodrome for BDM NUSofting has announced the release of BDM Installation Tool, a new free application that enables you to easily switch between "BDM ModPacks" in the Broken Drum Machine plug-in. PlugHugger Vanity for Strobe Plughugger has announced the release of Vanity, a new soundset for the FXpansion's Strobe synthesizer.